Our range of products include industrial rotameter and glass tube rotameter. We have carved a niche for ourselves by providing our clients with a qualitative array of Industrial Rotameter. Our entire range of rotameter is designed for measurement of Rate of flow indication in liquid & gas applications. 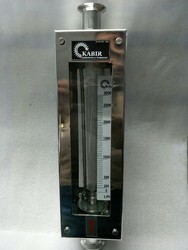 The offered rotameter is highly acclaimed among customers for its dimensional accuracy & performance. Moreover, our rotameter is offered in various customized options as per precise needs of our patrons. KABIR professionally managed fast growing company with impressive track record in manufacturing a complete range of Glass Tube Rota Meter. These rota meters are useful for measuring flow of air, common gases, water, alkalies, oil & organic chemicals. Our offered range of glass meters is appreciated for its features such as high tensile strength, dimensional accuracy and compact design. Glass Tube Rotameter is manufactured using optimum components procured from reliable vendors in the market. Looking for Industrial Rotameter ?